To provide you with an example of the kind of stories we publish every week, we wanted to share the following story with you, which is adapted from today's issue of MacStories Weekly. If you enjoy MacStories.net but want even broader and deeper coverage from the MacStories team, please consider joining Club MacStories. As a new member you’ll receive the newsletters, have access to our full archive of over 150 back issues, and enjoy other perks throughout the year. We work hard to make each issue special for Club members and would love for you to be a part of it. I've witnessed a slow but encouraging evolution take place over the past six years that has transformed WWDC for the better. When I first flew to San Francisco in 2013, WWDC was a self-contained event. Other than the Thursday night bash, the conference happened entirely within the fortress-like hulk of Moscone West. Developers and others in town for the week gathered outside the convention center in restaurants, bars, and hotel lobbies, but there were few organized activities if you didn't have a ticket. That's changed. Apple today announced that WWDC will take place June 5-9, 2017 in a new venue: the McEnery Convention Center in San Jose, California. 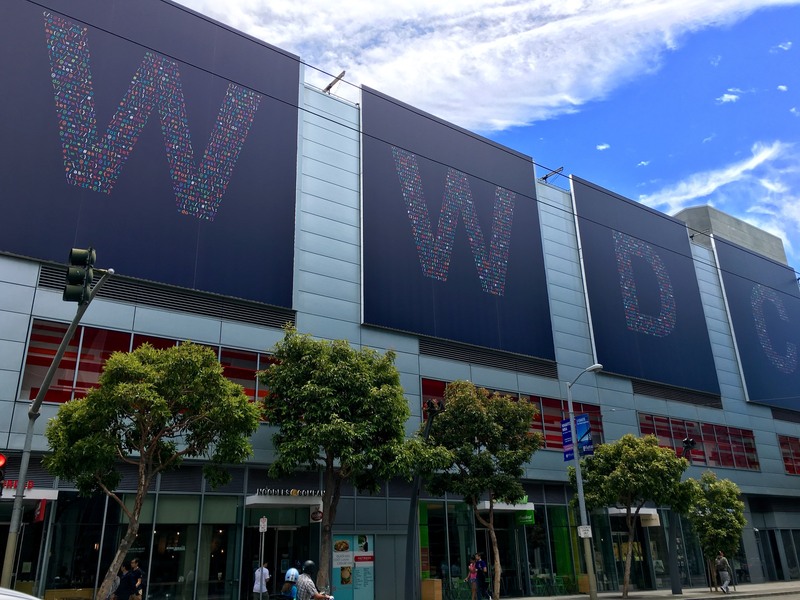 The announcement came as a bit of a surprise because in past years, WWDC was announced closer to the event and it has often been scheduled for the second full week in June. But the biggest departure of all is the change of venue. WWDC has been held at the Moscone Convention Center in San Francisco for the past 16 years. San Jose is much closer to Apple's new Campus 2 headquarters, which should facilitate the logistics of putting on the conference. The McEnery Convention Center will be the hub for thousands of attendees with great hotel, restaurant and entertainment options, all within walking distance. In addition to the keynote address, get-togethers, sessions and labs for developers, Apple is working with the city of San Jose and local businesses to celebrate the return of WWDC with very special experiences around San Jose throughout the week. Tickets will go on sale March 27th. Apple said that the number of tickets available for WWDC 2017 will be roughly the same as in recent years. Apple’s WWDC app typically gets a major update in the run-up to its annual developer conference. The remainder of the year, it’s unusual for the app to receive updates other than bug fixes and compatibility updates. 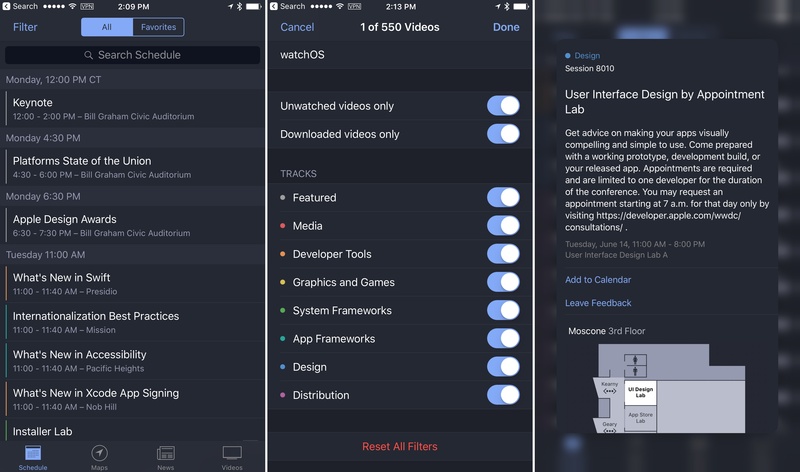 Now, you can filter WWDC session videos by whether they have been downloaded or watched. Support for dark mode on the Apple TV. For developers, the WWDC app’s utility extends beyond the conference itself, so it’s nice to see Apple refining the app this late in the year. With hundreds of videos available, the new filters are a welcome way to weed out watched, space-hogging videos. Apple’s history with events scheduled around WWDC has been stormy. In 2013, CocoaConf scheduled an alternative conference for developers who were unable to get a ticket to WWDC called CocoaConf Alt. The conference was set to coincide with WWDC until CocoaConf organizers received an email from the Intercontinental Hotel that they could not hold the conference due to a contractual conflict with Apple. More recently, AltConf (originally AltWWDC and changed) planned to stream the 2015 WWDC keynote and State of the Union presentations at the Metreon Theater across the street from Moscone West. Initially, Apple threatened legal action, but ultimately, agreed to allow AltConf to stream the sessions that Apple streamed itself. That bit of recent history makes today’s news that Apple is affirmatively promoting alternative conferences all the more welcome. Not only is Apple promoting AltConf, but also Layers, a fantastic design-centric conference that I attended last year and highly recommend. In addition to alternative conferences, Apple is promoting a couple of high-profile community events – the Beard Bash, hosted by The Loop and iMore, and The Talk Show Live, hosted by Daring Fireball. Apple’s acknowledgement of some of the best events surrounding WWDC is welcome and the sort of thing that gets me excited for WWDC. Not only does Apple now allow you to search the WWDC session transcripts – which ASCIIwwdc has been doing for a while – you can tap on a result (like this) and be taken to the relevant point in the video from your web browser. There are also filters to select returns from specific WWDCs and you can filter by platform, too. Extremely useful, and I wish I had this when I was writing my iOS 9 review this summer. 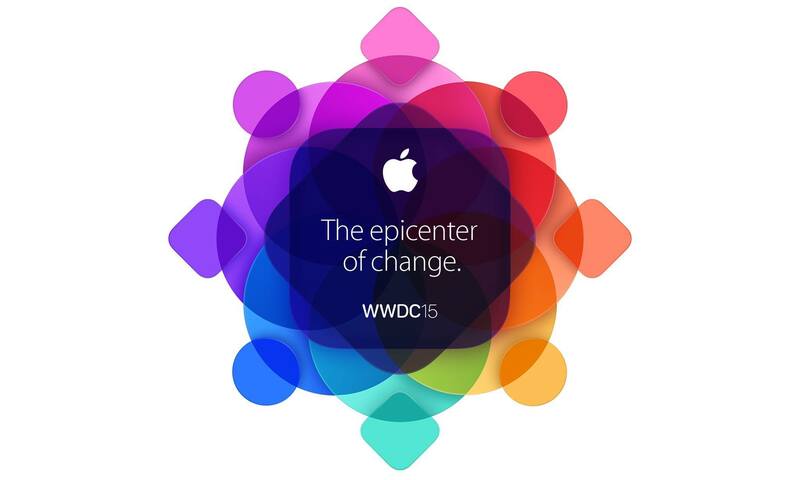 Apple has announced the official dates for WWDC 2015. 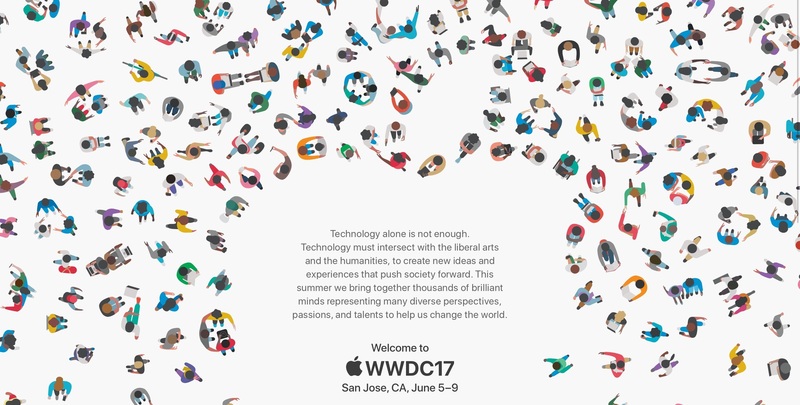 This year's WWDC will start in San Francisco on June 8 and runs through June 12. Like last year, Apple will be awarding tickets to attendees through a random selection system (effectively, a lottery). Developers will be able to apply today through Friday, April 17 at 10 AM PDT, and they will know their status by Monday, April 20 at 5 PM PDT. There are also 350 WWDC Scholarships available, giving students and members of participating STEM organizations a chance to get a free ticket. 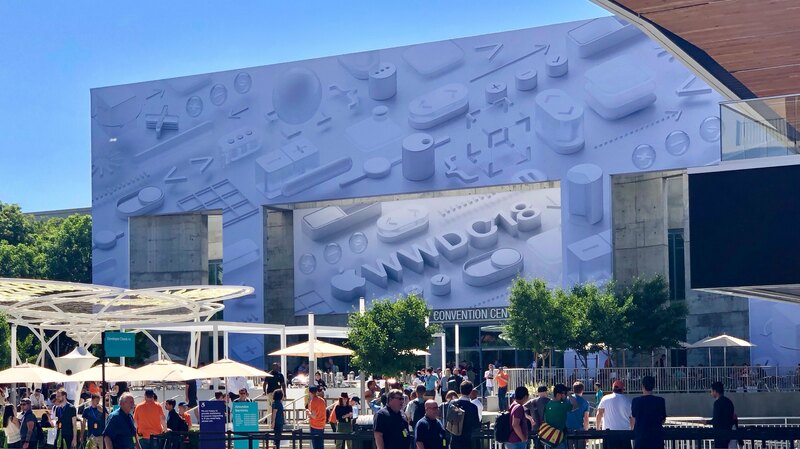 As with every annual WWDC, the conference will host "more than 100 technical sessions, over 1,000 Apple engineers, hands-on labs to help developers integrate new technologies and fine tune their apps". In the press release posted this morning, Apple doesn't mention an inaugural keynote, but confirmed there will be Apple Design Awards and news about the future of iOS and OS X. Similar to last year, some WWDC sessions will be live streamed via the WWDC website to give "developers around the world access to the latest information in real time". Apple also notes that videos from all technical sessions will be available at the end of every day. 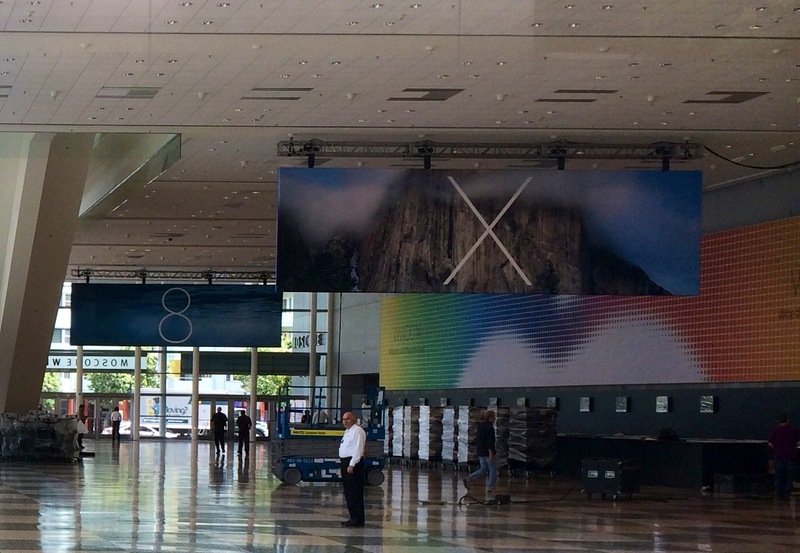 It's been four days since Apple began decorating Moscone West with WWDC 2014 banners, and today the company has started hanging new signage hinting at the next major version of iOS, iOS 8. Last year, Apple displayed banners suggesting a different look for iOS with a colorful and thin "7" logo on a minimalistic background. This year, Apple has taken a different approach with a water background (reminiscent of the iOS 6 banner in 2012) and a white "8" logo. In a press release published in April, Apple said that WWDC 2014 would give developers from around the world a chance to "learn about the future of iOS and OS X". 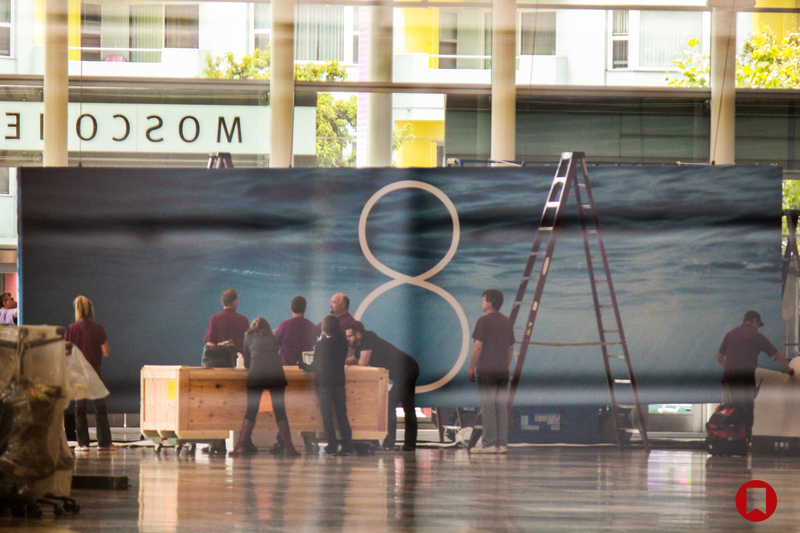 Apple is expected to unveil iOS 8 and the next version of OS X during the WWDC keynote; OS X is expected to receive a complete redesign with a significant overhaul of the Aqua interface, while iOS 8 is rumored to be an iterative update focused on refinements and new featured based on last year's bold new look. Update: The banner for OS X went up as well. 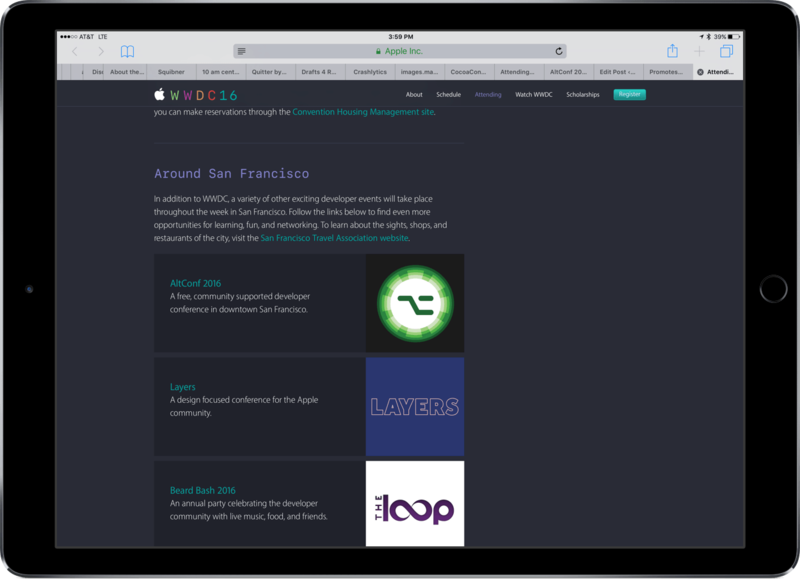 You can follow @MacStoriesNet on Twitter or our WWDC 2014 hub for updates. Our thanks goes to Steve Streza and Alex Novosad for providing the photos and helping us with coverage from San Francisco. 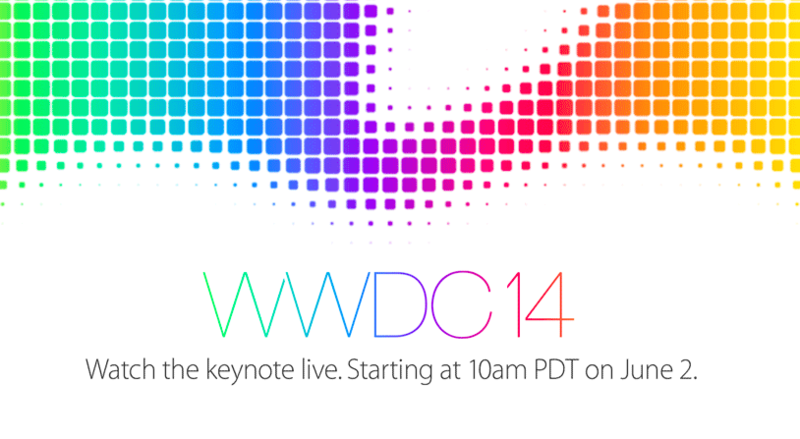 As first noted by 9to5mac, Apple has confirmed they will live stream the WWDC 2014 keynote on June 2. Speakers haven’t been revealed yet, but, considering the company's history over the past few years, CEO Tim Cook will likely kick off the keynote, with SVPs Federighi, Schiller, and Cue assigned to announcing new versions of iOS, OS X, improvements to iCloud and iTunes, or new hardware. According to the company's website, "exciting announcements" will be revealed during the special event, which will start at 10 AM PDT.